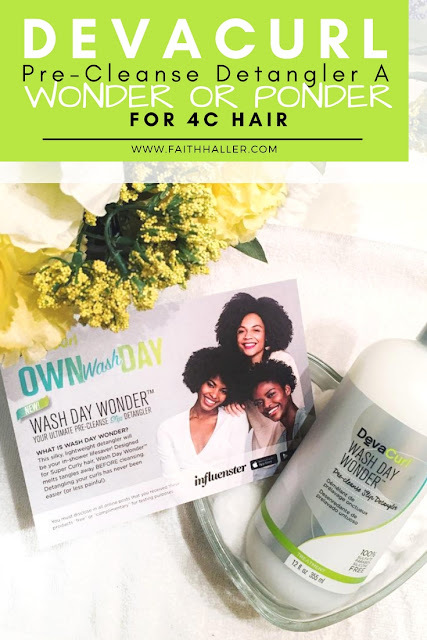 faithhaller.com: DevaCurl Pre-Cleanse Detangler A Wonder Or A Ponder For 4C Hair?? DevaCurl Pre-Cleanse Detangler A Wonder Or A Ponder For 4C Hair?? THEME SONG PLAYS... "dah dah dah dah dahhhhhh dooo dooo dooo dahhh DAH!" *I received this product complimentary from Influenster in exchange for my honest thoughts. These are their exact words. Not mines. I just wanted to put that out there so when I share my experience you will be able to refer back to that. What Does This Product Do??? The Wash Day Wonder Pre-Cleanse treatment is suppose to make the detangling process a breeze. It is formulated to instantly give slip & shine while reducing breakage. This part is very important because the ingredients is what makes up the product. And knowing about the ingredient helps so we'll know what to look for and the benefits of each ingredient. Many brands can make certain claims and its important to always be educated and do your research. This section is only for educational purposes. Water (Aqua, Eau) is a solvent that's capable of dissolving other ingredients that would otherwise be difficult to incorporate into the desired cosmetic. Glycerin is an humectant meaning that it attracts moisture to itself. So glycerin has the capability to attract moisture to the hair and ultimately improves the moisture retention for the hair. Glycerin along with other humectants are widely popular in many products ridding you from dry hair. Pentaclethra Macroloba Seed Oil also known as Pracaxi Seed Oil, is an oil derived from the fruit seeds of the Pentaclethra Macroloba tree, a canopy tree native to the northern neotropics. A natural hair conditioning agent, this oil is rich in oleic, linoleic, and bebenic acid. The ingredient has long been used by Amazonian populations for medicinal purposes. Today it is commonly used in natural conditioners as a replacement for synthetic conditioning ingredients. I was able to try this product two times. The first times was a FLOP! When I initially was doing research on this product and how to use it I notice that everyone that was reviewing this product or doing tutorials or was advertised were women who had a different hair textures from mines. They had 2C/3C type hair or even 4A & B type hair. And I wanted to see someone who had hair type like myself. I have very tight coily hair and in this photo above my hair was so tangled, and matted up along with dirty so I was hoping that this product would do the trick and help in the detangling process. So I followed the directions. I wet my hair. and tried to go through sections of my hair hoping that it would dissolve the tangles. There was a slight slip but I was very disappointed. I spent more time in the shower trying to detangle my hair and even after conditioning I still had to detangle my hair. Also the texture of my hair was very odd. I was not pleased at all. I had to lather my hair with tons of hair butters and hair oils to detangle my hair some more and make the texture better and bantu knot it so it wouldn't knot up again. Then I decided to give it another try because it's not a review unless I try it again and use another technique. So the second time around I had my hair in twists from the last time I washed my hair which was basically when I tried this product the first time. So I figured with my hair being in sections it will make the detangling process easier. I also applied it on dry hair instead of wetting my hair. In my opinion the product worked so much better with my hair being sectioned off. Now Because my hair was already in twists it wasn't much to detangled if anything to detangle. I felt like I did most of the work already. I did kind of notice the slip more because my hair was dry and not wet but it wasn't anything remarkable. I still felt like I spent more time in the shower than I should have. It wasn't as bad as the first time because I took a different approach but overall for me I'm not sold. And still the texture of my hair was very odd. Which I'm not use to my hair feeling wirery textured. Now maybe this works better on twa (teeny weeny fro) hair because you have a bit more control and not as much hair. I don't hate the product I just think it's just not for me. I'd prefer pre-conditioning my hair and just being done with it. I will say that products work differently on everyone and just because it didnt' work for me doesn't mean it won't work for you. If you are interested in trying out this product you can find them inside Sephora.